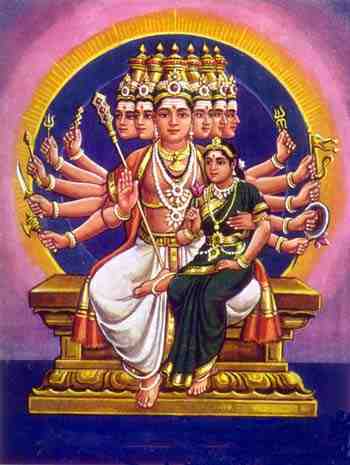 God Kataragama as Devasenapati, 'Husband of Devasena (Teyvanai)'. Ancient tradition has it that the wily god of Kataragama courted his local sweetheart Valli while he was already duly married to Teyvanai (‘Divine Elephant'), daughter of Indra, King of the gods. The tension between the god's two consorts is a familiar theme in the poetic oral traditions of Kataragama. In the following article, a Canadian professor of religious studies analyses the close affinity between Kataragama's living mythology and the shrine's continuing role as a natural setting for ethnic and religious reconciliation. Prof. Paul Younger teaches in the Department of Religious Studies at McMaster University in Ontario, Canada. A contributor to the Kataragama Research Publications Project, he wrote this article while attending the Kataragama Esala festival in 1990. Beginning with the new moon of Esala (July), the festival procession of Lord Kataragama proceeds for its nightly visit to the Valli Amman temple. Nearby the temple of Teyvanai Amman is silent. The swamis from her temple go to greet the Lord as he leaves for the procession, but Teyvanai Amman is clearly not happy about this nightly rendezvous with Valli. Like Lord Kataragama, Vijaya, the legendary father of Sinhala society, also had two wives. The local princess, Kuveni, defied her own elders to give him food and protection, and eventually to marry him and bear him children. His other wife from Madurai brought with her skilled craftsmen. Alatti Ammas perform an elaborately choreographed alatti puja every morning and evening in the Kataragama God's Mahadevale residence. Ever since, Sri Lanka has had two lineages living in the same house. The children of the Kuveni lineage have become the majority community speaking the father's Sinhala language, and rejoicing in the romantic ties of the warrior-god Kataragama with his local sweetheart Valli. The children of the Madurai lineage have continued with their mother's language and like the orthodox ritual traditions associated with Teyvanai Amman. The Kataragama festival provides a wonderful opportunity for the two wives and their many friends and relatives and children to get together each year for a fortnight of joyous celebration. Many just love the romantic overtones of the procession and drums and dances of those who accompany the Lord on his elephant. 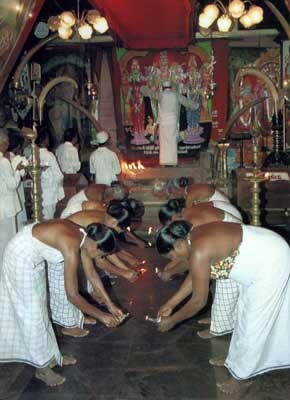 Among the ancient rituals associated with the romance of Kataragama and Valli is the role of the alatti ammas or Ladies of the Lamp ritual, handed down from the ladies of Valli's tribe who insist on protecting her even as she falls in love with Lord Kataragama. Maternal traditions do not die easily, and the Sinhala community as always shows a passionate loyalty to its roots, whatever the love affairs it has had from time to time with Indian culture, with colonial culture or, more recently, with the exports and violence mad e possible by ties to western culture. The alatti ammas or ‘vigil mothers' march in the procession and hold their lamps before Lord Kataragama to remind him, and everyone else, that they are watching to see that their daughter is treated right. In 1989, bombs of violence were hurdled at this procession and five of these women gave their lives. Since then their sisters and daughters are back with a quiet determination to protect the sacredness of their heritage at all cost. But what about the other wife? The Teyvanai Amman temple was built in the orthodox Hindu fashion to face east. It seems, therefore, to have its back turned to Lord Kataragama and to express the sorrow Teyvanai feels as he goes off for this meeting with his Iccha Shakti (goddess of desire) Valli. 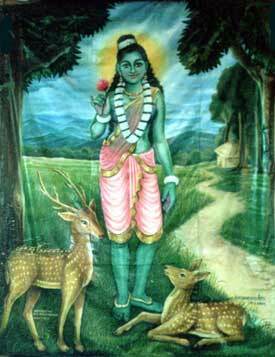 But Teyvanai is his Kriya Shakti (goddess of ritual activity) and it is im many ways through her that he gets things done in the world. The tradition of the Teyvanai temple is that it has always had highly-trained orthodox priests from North India and its rituals are very elaborate. This year (1990) the traditions of the Teyvanai temple look particularly sad. Millitary action has made it hard for orthodox Hindus to attend the festival, and some of the elaborate rituals of the swamis of Tevanai are not well attended. Fortunately, the kavadi-dancing and fire-walking they started are now followed by many others, and those traditions are carrying on with a flourish.  But in the tradition of Kataragama, the two female consorts are important. Lord Kataragama's love is clearly for Valli, but the knowledge and skills of South India are his as well, and priests and worshipers who uphold those traditions are acrucial part of this festivity. Now it is the Tamil people who suffer the mindless hand of violence, but they too will rturn to bring their rich knowledge of worship traditions to the festivals of Lord Kataragama. When the procession of Lord Kataragama reaches the shrine of Valli, friendly crowds from the adjacent Kataragama Mosque and Shrine are waiting to greet him. Sri Lanka's Muslims were not an original part of the mythology of the two consorts, but today they have taken their rightful place as the trusted brothers and sisters of both consorts. The traditions which placed the mosque so close to the Valli Amman shrine can no longer be traced, but the placement now seems appropriate. More and more, the children of Valli find themselves turning to their Tamil-speaking Muslim brethren to help settle disputes with the ‘other wife'. In a small incident as our bus left Colombo, misunderstanding started to develop as two Tamil-speaking older women boarded the bus and wondered if any of the younger people who had waited in the queue two hours would give up their cherished seats. Eventually and older Muslim man rearranged us all a bit so that everyone was comfortable and he was left standing -- a symbol of reconciliation. The festival in Kataragama has meant different things to each generation. Over thousands of years, its has provided the symbolic re-enactment of Sri Lanka's culture and society. The two wives are both here, and they are finding ways of getting along. And the Muslim brother is also here, making and important contribution. Perhaps it will be the prayers from his festival that will start the process of once again bringing healing and joy to this jewel island.